This post has 13,235 views. Another school year of graduate studies have gone by, and once again I managed to get a little time off before starting my summer research. Just like last year, my parents came to visit me and so we went on a few short trips. We stayed in New York City for a few days, and this year we also went up into Quebec to visit Montreal and Quebec City. Here is a short account of the trips with some photos. 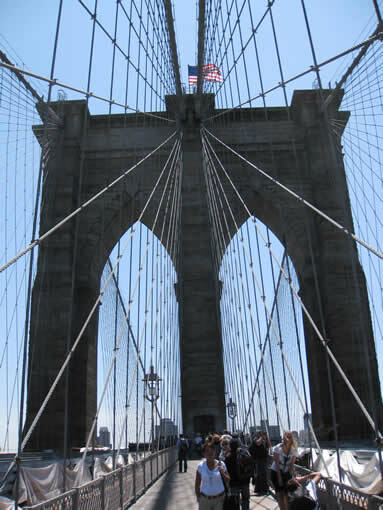 Taking a walk on the famous Brooklyn Bridge. My parents and I stayed in New York City for a few days last year, but there are still a lot of attractions in the city we haven’t seen. There is always something to do in NYC, so we stayed a few days this year too. Unlike last year, we drove into the city, and I had to drive across Manhattan to reach our hotel in Queens. For a weekend driver living in a smallish city like me, driving in Manhattan during rush hour was… an interesting experience. I now know what driving through a big city traffic jam feels like. It’s not something I would like to do too much of though. We made it to our hotel in one piece, and during the rest of our stay we of course used NYC’s extensive subway system to get around. 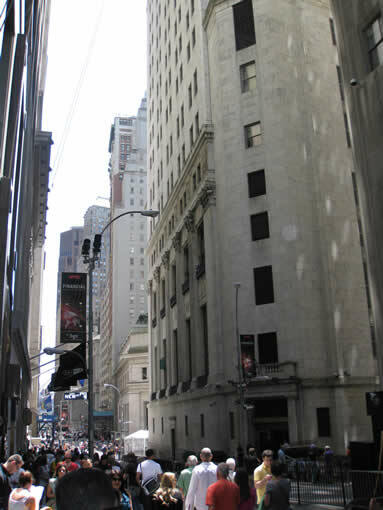 I’m not sure if this is actually a photo of Wall Street, but it’s definitely from somewhere very close by in the financial district. On the first day, we walked around in the downtown (south) area of Manhattan. We took a walk on the Brooklyn Bridge before heading into the financial district to visit Wall Street and the famous Charging Bull Statue. We went on a weekend so most of the people walking around were tourists instead of people in business suits.We hear the term “Wall Street” all the time in the news, but I really had no idea what Wall Street actually looked like. Wall Street actually was not a very big street, but it does have the New York Stock Exchange and other important buildings on the road. And contrary to popular misconception, the Charging Bull Statue is not on Wall Street, but it is pretty close by. 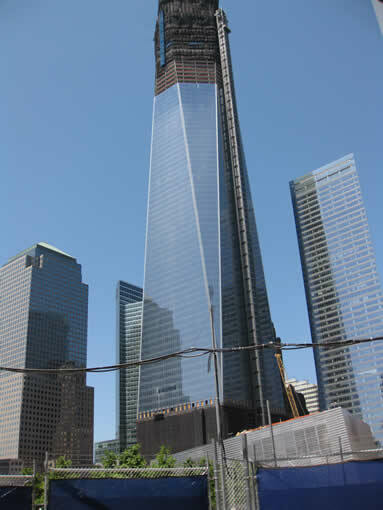 We also walked around the World Trade Center Memorial Site. The Memorial was open with limited access and one had to get tickets ahead of time to go in, so we just walked around the site instead. Afterwards, we headed to the southernmost end of Manhattan, also known as Battery Park. 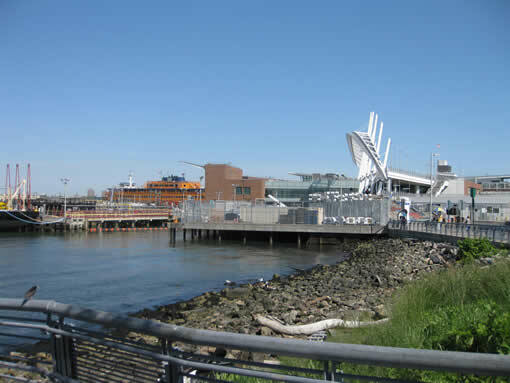 From the park, one can take boat rides to Liberty Island or Ellis Island. It was getting late in the afternoon however, so we took the free ferry to Staten Island instead. The Staten Island ferry takes around 25 minutes to go from Manhattan to Staten Island, and on the way we got a decent view of the Manhattan skyline and the Statue of Liberty. After arriving on Staten Island, we walked around the ferry terminal for a bit before taking the ferry back to Manhattan so we could go to Chinatown for dinner. On our second day in NYC, we visited the United Nations Headquarters on the east shore of Manhattan. The UN Headquarters has a visitors center that has a few exhibits and a gift shop. They offer guided tours of the building, but we didn’t feel like waiting around for it and just took a few pictures. The Empire State Building, standing tall among the other smaller skyscrapers in Mid Town. The view from the observation deck of the Empire State Building towards the Downtown Manhattan area. Our next stop was the Empire State Building. 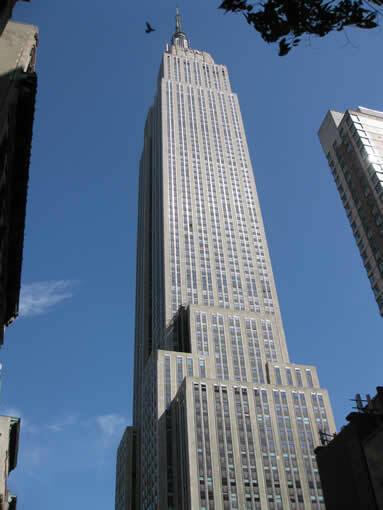 One of the fixtures of the Manhattan skyline, the Empire State Building had been the world’s tallest building for 40 years from the 1930s to the 1970s and still provides one of the best views of NYC from its observation decks. We went to the building to check out the observation deck on the 86th floor. 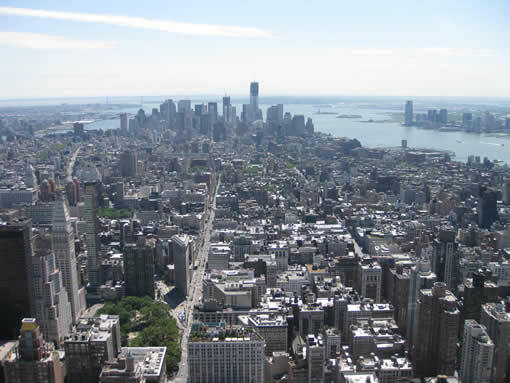 The weather was really nice that day, and thus we had a great view of Manhattan and surrounding areas. In the afternoon, we took the subway to Flushing to walk around and have dinner. We stayed in Flushing last year while visiting NYC, but we didn’t really explore the “Chinatown” area near the subway station. We visited the new Skyview Center and the Chinatown before sitting down for dinner. 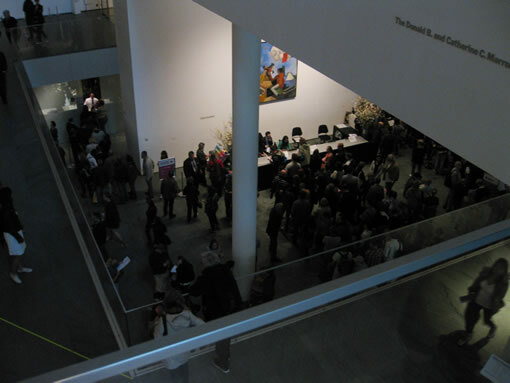 It was a busy day for the Museum of Modern Art in New York City. It was raining on our third and last full day in the city, and so we decided to go somewhere indoors and visit the Museum of Modern Art (MoMA). Apparently, many other people had the exact same idea, and so the museum was packed. We had to wait outside in the rain to get in, but thankfully it didn’t take that long to make it inside the building. I’m not really a modern art buff, but the museum had some interesting exhibits. It was also pretty big, so even people like me who don’t know how to enjoy the arts can walk around the museum for half a day. The weather didn’t look like it would get any better, so we found a movie theater and went to watch the Avengers. It was a pretty good superhero movie, and certainly better than the Thor or Captain America movies. Watching the movie was more or less the last meaningful activity we did in New York this time. There are still plenty of places in NYC that we haven’t gone to, and I’m sure we’ll go back sooner or later.